This project has become much more involved and challenging than we both originally planned. But it has been well worth it, even the the one hour drive out to my parents house. I would first take my daughter to her tap dance class, then leave straight from there. She was always excited to go because Grandma was ready to play, bake, make supper, watch a movie, play with sand in a tiny tea set, or just hang out while Grandpa and I were cutting wood. Well, onto the collar developments. 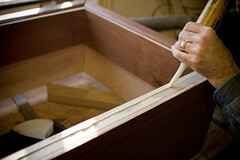 The side exterior panels were first put into loose position with one small finishing nail. They don't have to be fully glued and clamped to the core. Then the front panel was glued, clamped and nailed into position. The mitered corners came together beautifully, and what a relief this was. Having an additional 1/32 of an inch on each end allows these corners to adjust a bit, and they press together tighter when the middle of the panel gets clamped and nailed. 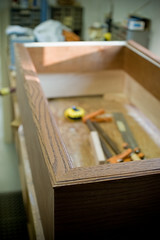 The back panel was then installed in the same way with the lid hinge cutouts positioned towards the top edge. 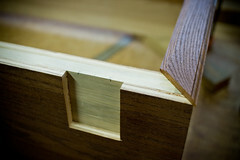 The side panels simply got one nail to hold them on while the mitered corners were glued and clamped. These corners, plus the top trim piece should hold the sides on sufficiently, especially because it isn't a load bearing side. At this point everything is still coming together nicely, and I can hardly believe we're almost finished. The top trim piece was cut to visually fix what will be an off-centered lid. Since the lid is mounted to the core piece, and the outside wall of the core is about 1/8 inch beyond the wall of the freezer, it will sit back about 1/8th inch. 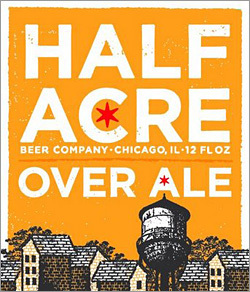 Again, after a few pints, no one would ever notice it. But, we did cut the top trim pieces so that the overhang in the front is 1/8 inch less than the 1/4 inch overhang in the back and sides. That should create enough optical illusion to remedy the problem. Cutting the mitered corners for these pieces was also a little tricky, and we got them looking pretty tight, and a couple rows of caulk and a couple finishing nails will seal and hold it down for good. With this design (as seen on many collar projects on the web), the collar looks much wider than the freezer. I knew this going in, and decided to accentuate this peculiarity by adding to it. 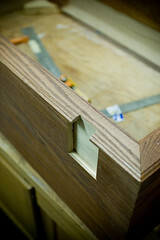 The top trim piece will overhang to create a tiny bit of crown style molding. I think this will look really nice in addition to a decorative leaf carved trim piece along the bottom edge. As with the hinge cutouts in the back panel, we also made these cutouts in the top trim, but this time they were cut much smaller, because the hinge at that point is narrow and doesn't have the flanged bolt anchors. My Dad went ahead to finish some stain touch-ups, and varnished it in time to take it home after a quiet and relaxing Thankgsgiving feast. It really looks AMAZING! I'm so happy & proud of us, and give thanks that we had this time together, to bond a bit, and to build something that should last a very long time. In the next post I will talk about mounting the collar and minimizing rocking movements. Some new and old faucets, the spacing, and drilling their shank holes. A final decorative touch. And then onto to the project finale, and New Years party debut. Sounds great, I am looking forward to see the pictures! That looks awesome. Great work. That will be a fine vessel for carrying your beer.